Bravura Lambert has a daughter to raise, a tumbledown house to restore, and a struggling business to run. She doesn’t have time to cry over a husband who only shows up when he needs money. She also doesn’t need Tonkiaishawien Redhawk, a Native American artist and wild horse jockey, interfering in her life. So what if he’s charming and helpful and makes her autistic five-year-old giggle until she can’t stand up? Bravura’s husband, Dane, was once all those things too. When Dane returns to find Tonk’s horses in Bravura’s pasture and his tools in her shed, he insists on moving back home. Despite his faults, Bravura longs to make her marriage work—after all, she took a vow. 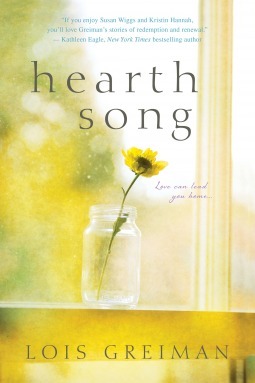 Hearth Song is #2 in the Home in the Hills books. I hadn't read the first one and it didn't matter as this was easy to read as it stands. Bravera is a plucky, hardworking woman - following in her father's footsteps she is an excellent builder and businesswoman. She has a daughter Lily who is a live wire and rarely still. She has been diagnosed with Asperger's syndrome, although Bravura is not quite sure the diagnosis fits. However her knowledge of horses surpasses most. The only thing Bravera hasn't got going for her is that she married a con vincing male who is weak and thinks the world owes him. And most of all Bravera owes him. He is a blind spot that Bravera has and in spite of what she hears and sees, seems to swallow it. Mostly! Tonkaiashawien is a recovering alcoholic with a somewhat difficult upbringing. He is also a gifted artist and in touch with his American Indian values and customs. He senses in Lily a wise spirit, and bonds with her. Lily of course is delighted, she is drawn to him and his horses. I liked the American Indian aspect to this story, and Lily who delights in animals and is deeply loved by most of the adults she knows. I love the cover of the book, although just not quite decided as to how well matched it is to the story. The ending was a little surprising and very satisfying. Wait! I have this one! Why haven't I read it yet? This definitely sounds like a book I'd enjoy. I have no idea why it's been sitting ignored on my Kindle for so long. Thanks for reminding me of this one! Great review! Thanks Kathryn this one sounds like my type of read. And its from one of my favorite women's fiction publishers too! I'll be picking this one up! Tonkiaishawien Redhawk sounds like a really complex and interesting hero and I think I would like Bravera as a main character. I'm so glad you enjoyed this romance! This sounds like a story I would enjoy! Surprise endings are nice. I like how there is diversity in this book. I have the first on my TBR. Never thought of that aspect but that is so true.